11.06 All hours worked on Saturday will be paid at one and one half (1.5) times the applicable straight time rate. All hours worked on Sunday, will be paid at two (2) times the applicable straight time rate. 11.07 On all jobs outside the free zone, the Contractors will notify the Steward Thursday, before quitting time, of work to be performed on Saturday, and the notification will be given on Friday of work to be performed on Sunday. In all zones where time or unforeseen emergency conditions prevail, a telephone call can be made. 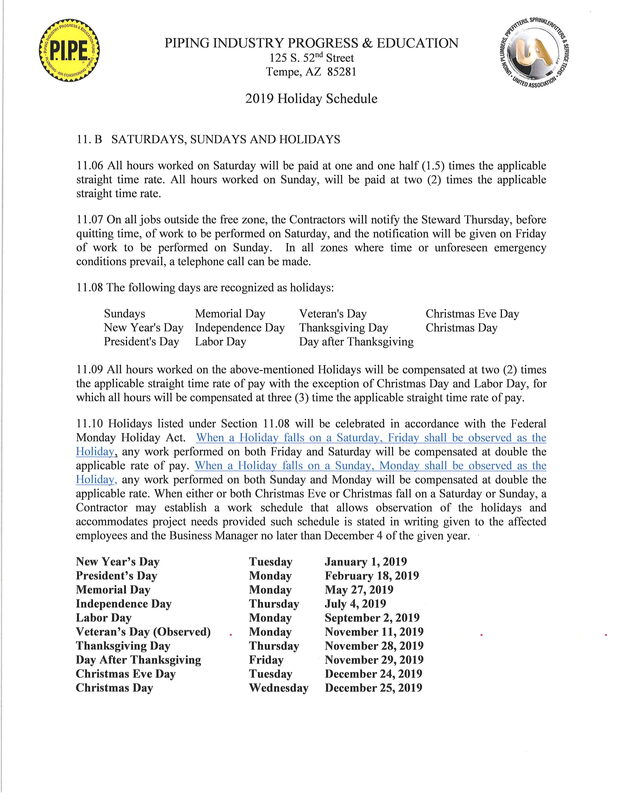 11.09 All hours worked on the above mentioned Holidays will be compensated at two (2) times the applicable straight time rate of pay with the exception of Christmas Day and Labor Day, for which all hours will be compensated at three (3) time the applicable straight time rate of pay. 11.10 Appropriate Holidays listed under Section B will be celebrated in accordance with the Federal Monday Holiday Act. When a Holiday falls on a Saturday, Friday shall be observed as the Holiday, any work performed on both Friday and Saturday will be compensated at double the applicable rate of pay. When a Holiday falls on a Sunday, Monday shall be observed as the Holiday, any work performed on both Sunday and Monday will be compensated as double the applicable rate. When either or both Christmas Eve or Christmas fall on a Saturday or Sunday, a Contractor may establish a work schedule that allows observation of the holidays and accommodates project needs provided such schedule is stated in writing given to the affected employees and the Business Manager no later than December 4 of the given year.